Does anyone here have experience with using a check valve to provide a vacuum break instead of one of those auto-vent deals? We’ve had our L2L system in place for several months now, but without a three-port valve to switch the flow from the sewer to the yard line. We’ve just been switching the laundry outflow tube between the two standpipes, but I’m getting ready to close the system and install a three-port valve, so we’ll need a vacuum break. When I initially set things up, I thought I would need a check valve in another place, so I bought one, but didn’t end up needing it. 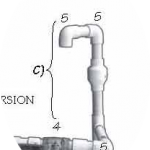 From Art Ludwig’s L2L design page, it looks like one can do this with a tee on the line, the check valve on the vertical leg of the tee, then two ell-bends to point the line back downwards (see the attached image). What I’m not clear on is how the check valve should be oriented. Should it open upwards, to allow flow up and out, or should it open downwards, to not allow flow in from the main part of the line? I’m thinking it must be the latter, because otherwise I’d end up with water all over the floor, but I don’t really understand how this design works to provide an air gap. Presumably the vacuum pulls the valve open to admit some air when it’s needed? You want the check valve set facing inwards – it should allow air into the system (to break the siphon) but NOT allow water out of the system. 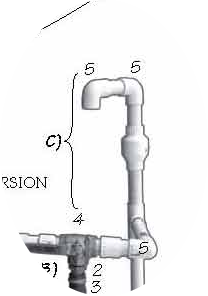 Note that swing check valves have to be mounted horizontally or pointing up (not down as in Art’s photo) – if they are mounted facing down the flapper hangs open and does no good.